iPhone vs. Android: A Game of Chess or Reversi? It isn't unusual for different companies to have their own strategies, but when two companies are competing in the same market, usually there is an expectation that they are playing the same game. But in the case of Apple and Google, each wants its mobile phone platform to win, but they aren't playing the same game. Google has had clear success with the sudden growth of Android phones. Some of Google's victory has been through the growth of the smartphone market, but the rest is like a game of reversi (a.k.a. Othello). In reversi, you surround the competition, and then all the pieces in between flip to your color. This leads to a rapid change in who has the most pieces on the board. Android is displacing Symbian (Nokia), Window Mobile, and others, taking their market share as users buy new smartphones. This gave Android a huge leap in market share this year (see Gartner: Android Share Jumps to 25.5 Percent, Now Second Most Popular OS Worldwide). The risk with reversi is that when another well-placed game piece is played, everything changes again. Apple sees the game being played, and it wants to protect its iPhone, but Apple is playing chess. 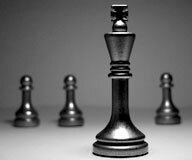 In chess, you win by capturing the other player's king. Your king is the most important piece in the game, and you do everything to protect it. For Apple, the iPhone is clearly its king. Apple has sent its lawyers against Motorola, Nokia, HTC, etc. You name it, and Apple is probably either suing or being sued. Apple has also spent big on advertising for the iPhone. Apple has to protect the iPhone, because it is the only phone it has. And by being so important, Apple has painted a big target on the iPhone that everyone is aiming at. If Apple and Google are playing different games, who's going to win? Apple wins if it can keep its king safe and continue to sell record numbers of iPhones every year. Google wins if it can flip enough smartphone users to Android; it's not about quality but quantity. With everyone playing a different game, we are going to have a lot of claims that their favorite company is the one ahead.